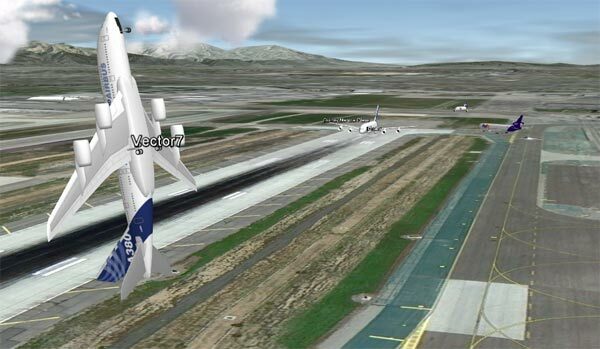 - Reverse: the A380 and MD11 are now equipped with thrust reversal. Keep pressing '-' or 'PageDown' to engage reverse. Hit '0' to reset thrust to neutral. - Dynamic air density: lift, drag and engine performance are degraded with increasing altitude. Maximum airspeed will increase as air density decreases. Service ceiling, cruise speed at altitude and rate of climb should respect aircraft specifications but has to be tested more extensively. - Aircraft model packages are optimized to load faster. - Su35 flight model has been revised to be a bit more gentle and forgiving. 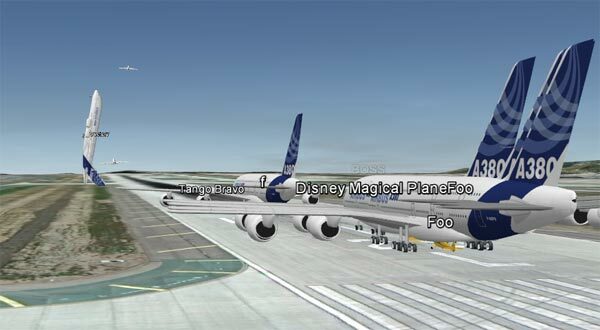 - A380 3D model has been improved. How did he manage that? It's been a little while since the last release and I have been hard at work at improving the general experience flying GEFS. As the number of users and the complexity of the planes grow, I had to spend some time doing optimization to make sure things keep running smooth. Here is a list of changes in this new version. The poll has now closed and the Airbus A380 is the chosen aircraft. I do not know yet what livery the aircraft will come in but I guess I will leave that up to the artist. I have no real guidelines for when the aircraft will be ready but will do my best for this to happen by the end of July. Please be patient and keep enjoying GEFS until then. Thanks to all the participants. And for those whose aircraft have not been chosen, be assured I will add more than just the A380 to GEFS in the future. Based on your suggestions, I made this (very long) poll so we can narrow down the results to just one candidate. Sorry for the huge list but I did not want to leave anybody out. I would like to stress that GEFS is technically limited for now and that simulating complex things like the Shuttle flight and re-entry or making a jetliner interesting to fly (Instruments, VOR NAV, ILS, Hydraulics, and what have you) is not yet achievable. I know there is a lot of demand for "big and fast" but keep in mind you don't fly an A380 as you fly the Piper Cub. That being said, make your selection and click on "Vote". 32,000 Visits in the last 30 days by 18,000 unique visitors. 10 minutes spent on GEFS per visit on average! Thanks to all and have a nice flight! Choose the Next GEFS Aircraft! EDIT: The final poll is now live. I just had a very exciting offer from sletch2003, the guy who modeled the Alpha Jet and the Sopwith Camel used in GEFS: he is offering to make a new model based on GEFS users' suggestions. Please post a comment here with the name of the aircraft you would love to see next in GEFS. Depending on the number of replies (and their variety), I will set up a poll to narrow down the selection. At the end of the process, we will have only one aircraft that sletch2003 will build for you. 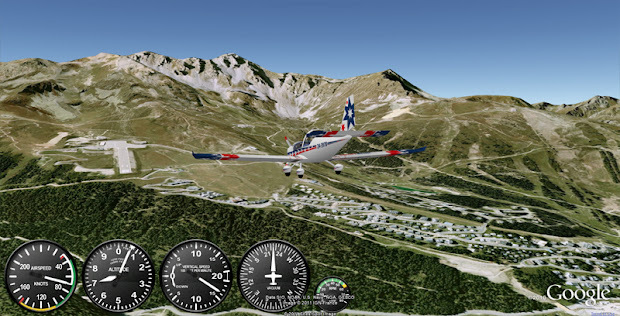 Flight simulators tend to run after filling up space with details and objects. What about enjoying "nothing" and seeing that it can be beautiful... for a while. This is a minor update and I am still in the process of fixing things (multiplayer, various bugs), but there are some improvements already so I decided to call it a release. ... and hopefully a multiplayer that runs nice and smooth! Stay tuned and have a nice flight. 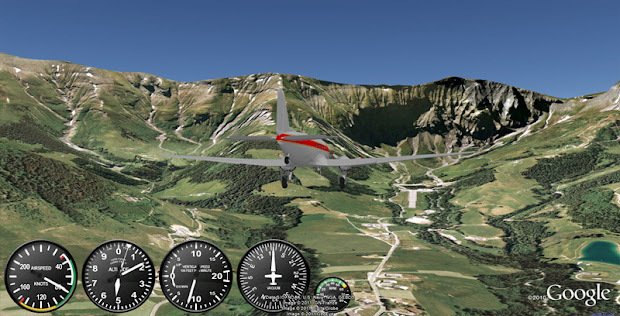 The French Alps provide a great flying area as the photo quality of Google Earth is beautiful there and the high relief just enhance it. It also happens that quite a few "altiports" are scattered in this splendid landscape. 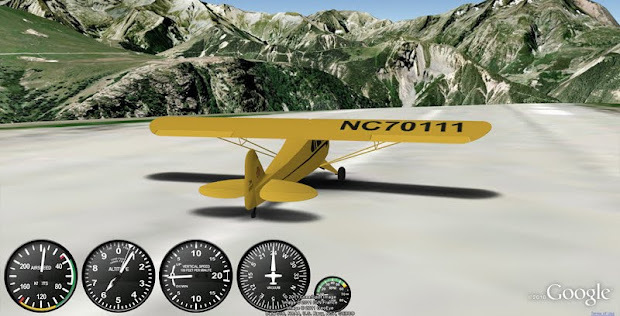 These are great to practice complicated approaches: the sloppy runways, surrounding mountains and fainting engine in low oxygen require a lot of skills to deal with. If this is just too simple for you, wait until I finish implementing real time weather and try the same approach with some gusts of cross wind! Also, you may know some other "Altiports" in different places and may want to share it. You can send me some direct links to GEFS at the right location. For that, fly to the desired location and use the "Get link" button in the bottom bar. GEFS is up and running on a brand new server: now it should perform! Sorry for the down time and thank you for your patience. I am doing some hosting migration and DNS maintenance. GEFS is going to be unavailable for a short period. You can still access it from gesim.keynoise.com for now.